These notes have been on Pat’s desk most of the season and they’ll still come in handy this week. We know there are people who don’t want to hear it but Saturday really is a bright point for the rest of Division III football. You know, the 99% of us who can’t lay claim to the term Purple Powers. 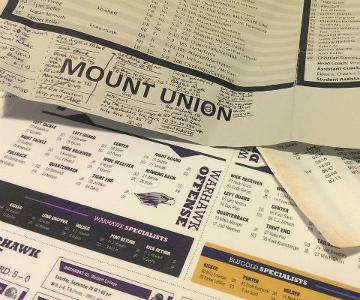 But with Mount Union and UW-Whitewater needing two one-point games to reach their eighth Stagg Bowl meeting, it should be clear that the two are very close to the pack, and that the “six-pack” of teams at the top we were talking about earlier this season who were all capable of winning the title were in fact capable of doing so.